Paul McCarthy grew up surrounded by the omnipresent language and imagery of American consumer culture. Paul McCarthy distorts and mutates familiar forms; they take on a carnivalesque and disquieting theme, blurring the line between the grotesque and a circus like spectacle. Paul McCarthy at Tate Modern will feature the largest-ever inflatable sculptures outdoor on Tate Modern's north landscape. On Level 5 there will be drawings and maquettes of the sculptures. 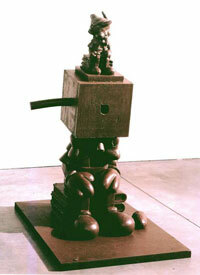 Blockhead, newly commissioned from the American artist Paul McCarthy, will be over thirty-five metres high. The sculpture will be a spectacular addition to London's Bankside and the first major installation on Tate Modern's North Landscape. Paul McCarthy's installation, The Box, was an exact yet dramatically skewed replica of the artist's entire studio placed inside a giant wooden crate. Set at 90 degrees, McCarthy's studio-in-a-box was physically disorienting with every piece of furniture, video equipment, tool, paper and prop emerging from the right hand wall instead of the floor. Paul McCarthy's role as purveyor of difficult truths has made his work shocking and incomprehensible to many viewers. This has put McCarthy in an unusual position -- he is a well-known mid-career artist with an evolution that is heavily shrouded in myth and innuendo. Paul McCarthy was born in Salt Lake City, Utah, in 1945. He received his BFA from the San Francisco Art Institute and his MFA from the University of Southern California. US artist Paul McCarthy was taking a break from the final adjustments to the installation of his first major retrospective show in the UK, at the Tate Liverpool. We joined him for a drink, along with Tracey Ruddell from the Press Office. When I first saw the building where we videotaped Piccadilly Circus, it was empty and abandoned, but the teller windows and other vestiges of its life as a bank had been left intact. I didn't have any intention of making a piece there--I was just checking out the space with my gallerist. For a number of years, Mike Kelley and Paul McCarthy - Los Angeles artists who have independently established their influence on the international art world - have also worked collaboratively. The exhibition at The Power Plant represents the first time their jointly conceived works have been presented in North America. Mayor Giuliani may react with shock to artworks, but it's rare for those in the art world to be shocked by art. Startled is usually the best we can do. Either we're the most well-adjusted crowd around, or we're out of touch. La La Land Parody Paradise is the most comprehensive exhibition yet of works by the American performance artist and sculptor Paul McCarthy. It runs at the Whitechapel Gallery in London until January 8 2006. Paul McCarthy, geboren 1945 in Salt Lake City /USA, wurde seit den späten 60er Jahren durch seine Live-Performances bekannt und gilt mit Chris Burden als ihr Hauptvertreter in der Kalifornischen Kunstszene. Indem er die Performance dann auf Video aufnahm, erhöhte er die Distanz zum Betrachter.